Rise to the island's defence using the elemental towers and devastating spells, which can fend off any possible enemy. Don't let the hordes of Darkness discover the secret of the island! And defend the ancient knowledge from the evil! Take your loyal staff and and summon the elements to your aid. The faith of ancient knowledge, and the whole world is on the line! 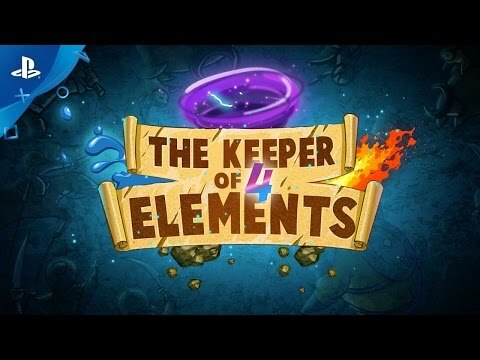 In the role of the Mysterious Monk you have to protect the Lost Lands, which keep the secrets of the four elements magic, from the Dark Lord and his minions. Towers with the power of elements in them, and spells, attacking the enemies with earthquakes and hurricanes - all this will help you. And those who can survive, will meet the monk and his loyal staff. Can you correctly use this wealth of destruction? 24 variations of development are available for only 4 basic towers, and these variations can drastically change their mechanics. Also, don’t forget about 36 improvements for magical arsenal. You can improve specific type of towers or one of powerful spells to the point, that changes the dynamics of the game completely. What do you prefer: build huge defensive towers or just crush the sky on your enemies with just one simple swipe? You have to choose often, because hordes of enemies always think ahead and are waiting to make a move. In the ranks of the enemy you will find stone trolls, that are not afraid neither fire nor rocks, quick warriors, that charge your towers relentlessly leaving nothing behind. Travel on the beautiful island, defend your base from enemies and enjoy the scenery. From sunny beaches to green fields and sandy deserts, to the hidden Temple of Scrolls. Visit the mountains, where jaguar riders will attack you in the most unexpected moment. Contest the bridge above the boiling lava against the giant scorpion. And if you can survive through this hell, you will find the pure evil on the peak of the mountain - the Dark Lord. The faith of the world is in your hands.